Have You Started the 100 Yet? I am Addicted! Last summer I discovered the captivating show known as The 100 on The CW. I found this show when I was in need of a GREAT binge. I mean, the type of binge where you fall asleep in your work clothes and when you wake up, you continue without changing. Well, I committed to this show and even ordered take out TWICE so I did not have to get up in the middle. This show has a unique plot that is bold and explores a realm that is not often explored. I hope after reading this article you jump into pajamas and start to binge this show to your heart’s content. Humanity established residency in space when the world became drenched in radiation and was no longer inhabitable. After 97 years of living in space, the Arc was running out of supplies and could no longer sustain life. With 2400 people living on a spaceship, it is understandable that supplies may start running out. The “adults” on the ship came up with a plan to send all of the children to Earth to see if it was habitable. The show is called the 100 because that is the number of children that were sent to the surface. The show follows the fearless Clark, as she and the group of 100 children attempt to survive on Earth. All of these children were locked away for committing a crime in space and are being used to test the habitability of the planet. Not all of the children deserved to be locked away, but some of them committed heinous crimes. As the children start to explore the planet, they become divided. One of the biggest surprises that children realize very early on, is that they are not alone. Against all odds, some people managed to survive the radiation and are not making the best impression to the children. The people who survived are referred to as the Grounders since they are from the ground and everyone else is from the sky. The show flashes back and forth between what is happening with the children on the ground and the decisions the adults are making in the sky. Clark’s mom is both a doctor and one of the leading members of the adults. Since supplies are running out, the leaders have to make tough choices to survive even if it means sacrificing a few of their citizens. They still have 2300 citizens aboard the ship, and somehow they have to figure out how to create harmony when 100 of their children were sent to the surface. And, to make matters worse, communications are not working well with the children, so no one knows if they are alive. In the very first scene of the show, we watch Clark as she draws what she imagines a landscape on Earth would look like. It is weird to think about a future where generations of people have never seen or been on Earth. It is not the first TV show to write about people that have never seen Earth, but very few have shown people’s first steps on Earth. Five minutes later when the children arrive, they run around as they have never seen greenery before. I wonder what I would do first if the surface was brand new to me. What would you do? I am genuinely inspired by Clark’s mother with her perseverance and pure intelligence as she attempts to reason with various members of the council. Abby is not perfect in any sense, and has regrets from her time on the arc, but her imperfections are what I love about her. She always does what she believes to be the right decision even if no one else agrees with her. She listens to her heart and does not act out of greed for herself, but what is best for her loved ones and the community. 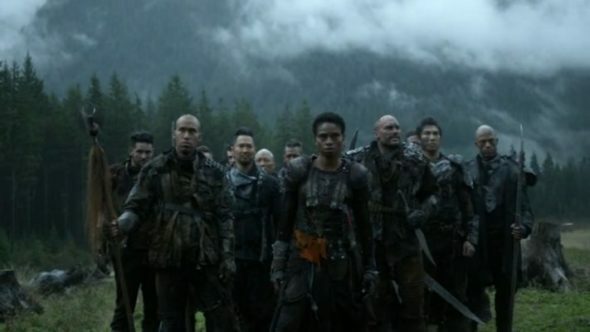 If you are not hooked yet, well, this show has so much more to desire in the following seasons… I do not want to spoil it for you, but it is so hard for me NOT to write about season 3… The children, adults, and the grounders all show versatility and perseverance through difficult times. There is romance, betrayal, bromance, and a thirst for drama that leaves me yearning for more, and more. When you meet her, keep a close eye on Lexa. Like many great television shows and movies, the 100 is based on a novel series by Kass Morgan. So far, four books have been published with the final book released in 2016. From what I can see, there a few differences between the show and the book, but the characters we know and love are pretty much the same. I have not read all of the books yet, but with my upcoming trip to Rome, I may be able to change that. I personally love being able to compare a book and a TV show, but sometimes I have to think of them as separate entities.